A healthy, green lawn is a summer pleasure and a homeowner’s joy. But automatic lawn sprinklers do require maintenance or repair on occasion. Sprinkler heads or valves may wear out, or dirt and debris may interfere with the sprinkler’s operation. 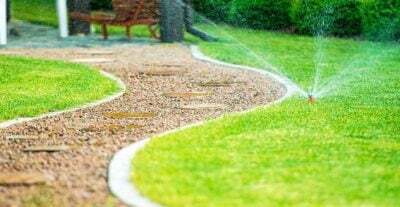 Make sure your lawn is spring-ready with these DIY fixes to the most common lawn sprinkler problems. How do automatic lawn sprinkler systems work? •In most neighborhoods, water is delivered to homes through a city water main. •A smaller-capacity supply line connects to your home from the water main. •A water meter records the number of gallons of H20 flowing through the supply line. 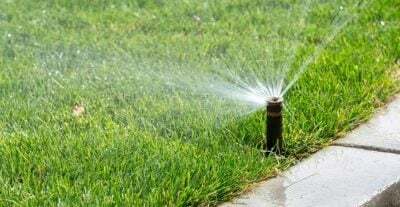 •An additional connection is made between the meter and your home, supplying water to your lawn sprinkler system. •Next, a system shutoff valve is installed. The shutoff valve allows you to turn off the water to the system, without shutting off the water to the house. •Water back-flow is prevented with a device that stops water from draining back into the main supply line. •The water is held under pressure behind the sprinkler system valve. •When the valve receives a signal from the electronic irrigation controller, the valve opens. •Water flows to the sprinkler heads and the heads pop up and spray. Sprinkler systems are a great way to keep your lawn watered and healthy. However, if you live in a drought-stricken area, it may not be the best option for your lawn and garden. Learn how to drought-proof your garden here. Dirt can get inside sprinkler heads, causing clogs and lawn sprinkler problems. If one or more of your lawn sprinkler heads fail to work, try one of the simple fixes below. But first, here are signs of a clogged sprinkler head. 2. Dig the head from the ground — unscrew the head from the riser. Disassemble the head by steadying the canister and turning the head counterclockwise — lift the head out. 3. Find the plastic screen basket located at the base of the head. Remove the basket with your pliers or a screwdriver. 4. Remove dirt and debris by swishing the head and screen basket in a bucket of clean water. 5. Place the cleaned basket back inside the canister; place the clean head back on the riser. 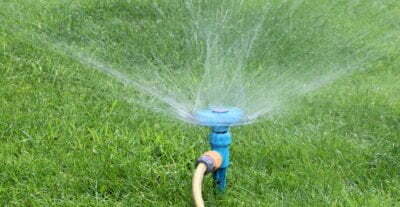 Lawn sprinkler problems may be caused by a broken sprinkler head. • A head that is set too high (a lawnmower blade can break sprinkler heads). To replace a sprinkler head: Purchase new sprinkler heads made for your particular system from home centers and hardware stores. 2. Using a transfer shovel, dig a hole around the sprinkler head approximately 2 feet in width. Set the sod aside to put back in the hole later. 4. Locate the sprinkler head. Turn the head counterclockwise to remove it from the riser. (Careful – don’t let dirt fall into the riser.) If the head fails to loosen easily, hold the riser with pliers to keep it from coming loose from the fittings below. 5. Screw the new head onto the riser until hand-tight. 6. Test the sprinkler system. Learn more about repairing or replacing lawn sprinkler heads here. After seasons of use, lawn sprinkler valves can wear out. If the water fails to shut off, this may be a sign that the diaphragm is torn or damaged. A faulty diaphragm won’t be able to stop the flow of water so the sprinklers will fail to shut off. Valve rebuild kits are available at hardware stores and home centers. 3. Unscrew the bonnet from the valve box by untwisting the plastic outer ring. Remove any moisture, pebbles or dirt from the inside of the box. 4. Remove the diaphragm and spring gasket located underneath the bonnet. Locate the small alignment holes. 5. Take a new diaphragm and place it inside the valve box – making sure to line up the holes. 6. Place the spring on the diaphragm post – place the bonnet on top. 8. Attach the outer ring to the bonnet and screw it back on. 10. Test the sprinkler system by turning the water back on slowly, and check for leaks. 11. Check the valve to make sure it turns on and off. Banish annoying lawn sprinkler problems with these DIY how-tos for automatic lawn sprinkler systems. You’ll save money in repair costs, and enjoy a lush, green lawn this summer before you know it! Interested in more lawn care tips? Visit here.